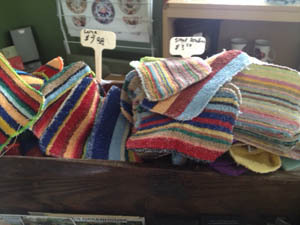 Rainbow colored scrubbies that can be used for cleaning almost everything inside and outside the home. Often called "The World's Finest Pot-Scrubbers" or "Rainbow Scrubbies", they are amazingly gentle and strong 'scrubby' but not scratchy. 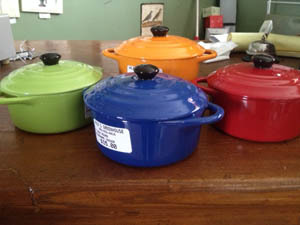 Sold in two different sizes they are one of the most popular things we sell in the Gift shop. They are truly the best scrubber thing you could have. They can be used on anything: ideal for cleaning stainless steel and nonstick pans, countertops, glass stove tops and much more. They are awesome in the bathroom, on tubs, sinks and showers. They only cost $3.50 so anybody can afford to have several. People come from miles around just to buy one or more, and then mail them to family and friends, and then get told to send more. We have people bring their visitors in and tell them they have to have them. Heaven forbid we ever run out of them. 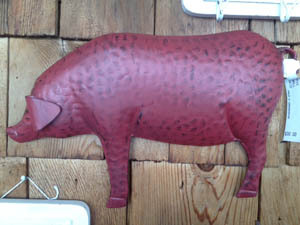 Pigs are "Popular Porkers" every decorating magazine has the use of a little "swine art" somewhere. These beautifully textured pig art have a red finish are perfect hung in the most contemporary home, rustic cabin or family kitchen. A wonderful birthday gift for the person who has everything (because I bet they don't have a red pig that hangs on the wall) Indoors or out this wall hanging is a way to express yourself in an unique way. Page corner bookmarks are cute, practical and deeply under-represented in the world, and will set you apart from all those same flat rectangular bookmarks. Corner bookmarks are where it is at. These beautiful multicoloured book markers are perfect for the reader in the family, but also great in the kitchen to mark the favourite recipe, in the car to mark the spot on how to resent the car radio and change the time. 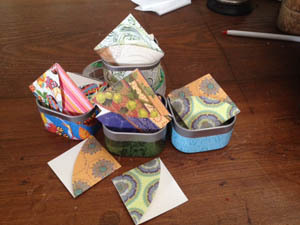 And they come in a cute little tin that every little girl will want before all the page savers are finished.